What kind of office chair are you currently using? A wide variety of office chairs are available nowadays with cheap ones that are below ₱1,000 to expensive ones priced around ₱50,000. A lot of brands are available too from Ergodynamic, FanTech, BraZen, Eams, etc. There are different features too from those with reclining features, ergonomic designs, and president chairs. For those who are sitting in their office chair for a long time, we will show you the pointers in choosing the best office chair for you, and those that can help increase your productivity in rank order. We compared the best products online and their reviews, hope this can help you with choosing the best office chair for you! To find the best office chair for you, you need to check the characteristics of each office char and check your budget. By understanding the characteristics of each chair and your budget, you will be able to find the best office chair for you. First, let us check the available office chair types. Office chairs can be largely categorized into 4 types. Let us look into their characteristics first. 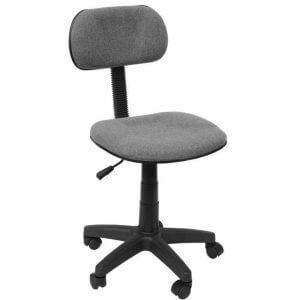 Most offices use this type of rotating office chair. They are just standard and there are no special features, but they are known to be one of the most affordable. There are some that have a backrest that can be tilted, or those with armrest. 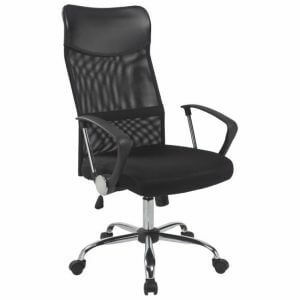 If you are looking for an affordable office chair, then this will be your best option. Though if you will be sitting on it for long hours, we suggest looking for those with armrest, or those with good cushions to lessen the burden on your body. Ergonomics means “human engineering”, and an ergonomic chair is a chair developed by researching a human being’s physiological and psychological characteristics, for the most comfortable sitting experience. The goal is to lessen the stress and the burden on your body even for long hours of use. Most people who sit on office chairs for long hours have shoulder and lower back pains that usually stay. Changing your chair to an ergonomic chair can end that pain by making your sitting position more natural. This is highly recommended for those who are looking for the perfect partner for their long hours at work. Office chairs are designed to be placed in front of your desk, but there are office chairs with reclining feature that can help you rest during your break time. Some office chairs have rocking features, but reclining chairs have backrests that can be tilted, so you can relax more. There are reclining office chairs that can be tilted for up to 170 degrees, or those with leg rest, making your resting position as near as lying as possible. 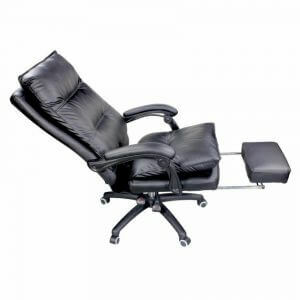 For those who believe that resting is part of your job, we highly recommend reclining office chair! Executive chair is not only comfortable to sit on, but also has a stylish appearance. They are also called president chair because of its design. There are those made with genuine leather, or those with comfortable backrest, with a quality that definitely deserves the name “executive”. 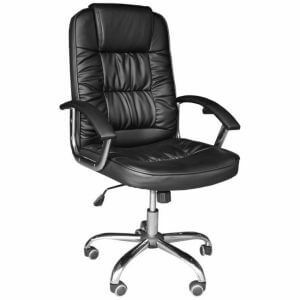 Executive chairs are very comfortable and have a luxurious appearance. The price can be a bit more expensive, but we highly recommend it to those who want a perfect work environment. Your productivity might improve too when you’re seated comfortably. Now that you’ve understood the 4 types of office chairs, the next thing you need to check is the materials. Check the material of the chair that you need in your office. The most common office chair is made of fabric. It is the most popular because of its affordability. 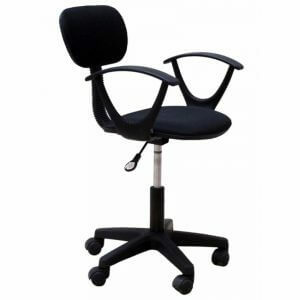 The appearance and comfort of fabric office chairs will largely depend on the kind of fabric used. Check closely the pictures available, or touch them if possible to check the fabric quality beforehand. 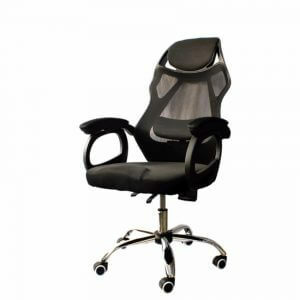 A lot of high-end office chairs use the mesh material. The best thing about this material is that it is highly breathable. You can sit on it for long hours without the stuffy and moist feeling. 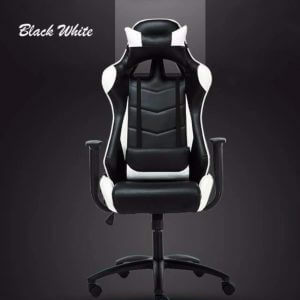 It is also known to fit perfectly to the user’s body, and is often used on the chair’s backrest, giving you a great hold when you lean onto it. It can be a bit more expensive than the fabric office chair, but is recommended to those whose priority is the chair’s functionality. PVC leather is also called fake leather. It has a luxurious appearance like a genuine leather. 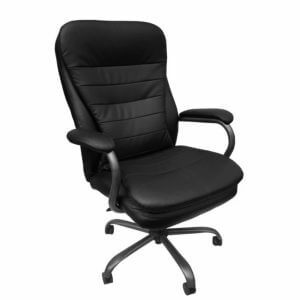 The price is cheaper than a genuine leather, making this the most popular choice for affordable executive chairs. A downside is that it can be a little sticky during hot summer days. Although not a genuine leather, the PU leather made with polyurethane has a higher quality than the PVC leather. 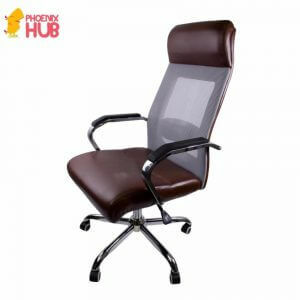 It is also more durable, highly recommended to those who are willing to spend more for a long-term office chair use. 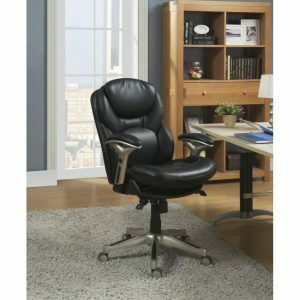 The first class office chair is made of genuine leather. It has the durability of a natural material, and it ages beautifully that you can enjoy for a long time. Office chairs that use genuine leather are very expensive, but can be very worth it. Highly recommended to those who want an office chair that can last for many years. We will now show you the chairs that can help improve your productivity in rank order. We will also show each chair’s strengths and characteristics. 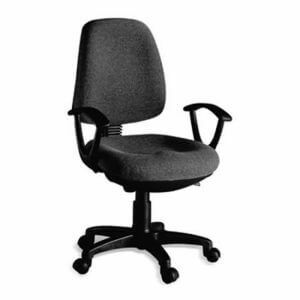 Try imagining yourself with the office chair, and get the perfect office chair for you! This swivel office chair has an armrest for added comfort but no other additional features. This product might be best for meeting rooms where people won’t be seating for long hours. Also highly recommended for those who are planning to mass purchase office chairs, or for those whose priority is the chair’s affordability. This swivel chair has the 2 of the most wanted features in a chair: armrest and ergonomic design so you can sit on it comfortably for long hours. Reviews also mentioned that it is very easy to assemble, even without any help. It can only endure up to 80 kg (175 lbs), so we can’t recommend this product to those with a big body built. This product has a tilt lock feature with a lower back massager that can be powered by USB port that you can either connect to your PC or your power bank. Perfect for those who are suffering from back pain due to long office hours. Though you need to be careful when leaning on the backrest as some reviews mentioned that the sturdiness is only satisfactory. This product uses a combination of leather and mesh to keep the price as affordable as possible while making sure its high quality. Perfect for high ranking professionals with its classy and sophisticated design. It is double cushioned for higher comfort, but can only recline for a limited angle. 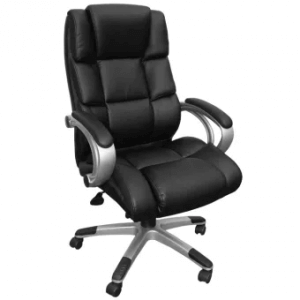 The faux leather used in this chair will give your office a professional and elegant look. Not only that, but this ergonomic chair can also tilt for up to 110 degrees perfect for those break time power naps! Please note that assembling this product alone is a bit challenging because of the product weight. Have you found the office chair that will make your productivity higher? The fastest way to find the perfect office chair for you, it is important to know the specifications of each chair. Hope you can find the best office chair for you that can lead to your work environment’s improvement!